The equipment you see in all gyms target different health and body goals. For instance, dumbbells of different weights or pull up bars are for all kinds of people who want to develop their arm muscles. Meanwhile, treadmills focus on cardiovascular endurance. Another example is the elliptical trainer, which is a more all-around machine. It can target three areas at once: arms, legs, and cardiovascular endurance. Lastly, we have the exercise bike. Exercise bikes are perfect for beginners because they are so easy and safe to use. 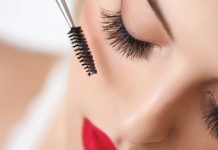 They also give a lot of health benefits despite how simple they can be. What most people don’t know, however, is that there are several types of exercise bikes. One of which is the upright kind. To know more about this type, stay with us as we give the best upright exercise bike in today’s market based on careful research and product testing. Exerpeutic Folding Magnetic Upright Bike has a massive weight capacity of up to 300 lbs. It also prioritizes comfort through its wide seat and thick cushion. It can even be adjusted to match with the height of a person, generally from 5’3” to 6’1” users. Another adjustable feature is the tension level so you can have a more challenging experience if you want to. These factors make this apparatus a versatile one for all body types. Aside from its basic features, this upright exercise bike also has a Hand Pulse function to monitor your heart rate. Meanwhile, you can ensure quiet pedaling by simply tightening the bolts or screws. Regarding storage, this exercise bike is compact in nature, foldable, and movable – thanks to its transportation wheels. Body Rider Stationary Fitness Softer Adjustable Seat Exercise Upright Fan Bike has extended movable handlebars to ensure the improvement of your upper body, not just the lower muscles. It also has a system called the high momentum fan wheel to give you smoother movements. Its knob for intensity adjustment is very easy to control. This upright exercise bike guarantees stability through its tough steel frame. 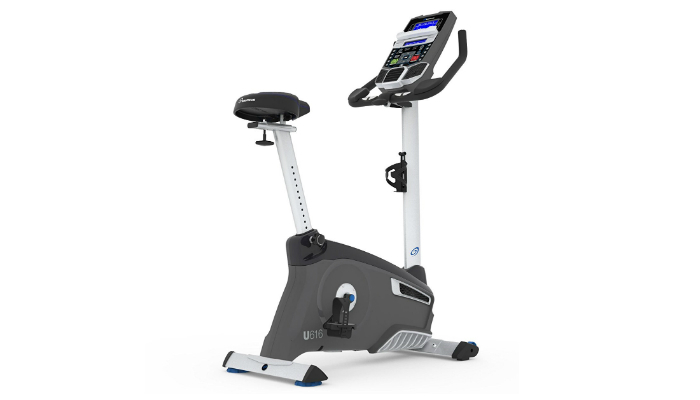 Nautilus U616 Upright Bike gives importance to monitoring. It has two LCD displays to present your overall workout status based on 13 technical details. It even has a USB port to charge one of your gadgets while you are biking. 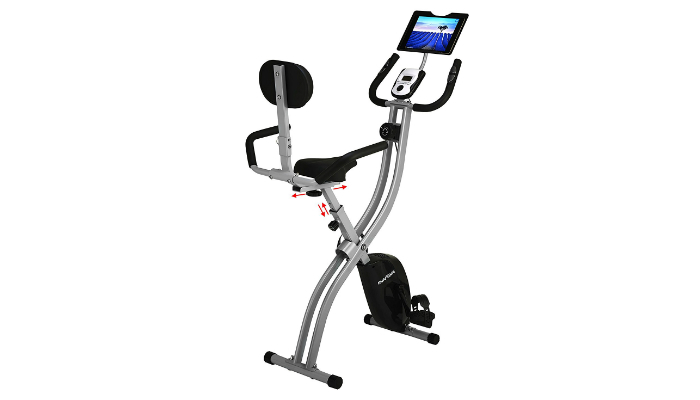 This ultra-modern exercise bike has Bluetooth, memory for four user profiles, 25 resistance levels, and 29 programs. Innova Health and Fitness XBR450 Folding Upright Bike is another upright exercise bike with several innovations. It has a backrest so you can maintain your posture and have an easier time using it. It also has a special holder for your iPad or tablet to entertain you during the workout. Its LCD display will show your speed, distance, time and calories burned. Marcy ME-708 Upright Exercise Bike is an attractive one, thanks to its powder coating finish all over the steel frame. It can be used by beginners as well as fitness experts since it has eight levels of difficulty with its magnetic resistance device. Its LCD monitor displays bigger numbers for easier reading. Lastly, the pedals will support your feet perfectly, leading to better control. How? They have adjustable straps to completely secure your feet. Now, let’s learn the exact purpose of upright exercise bikes. 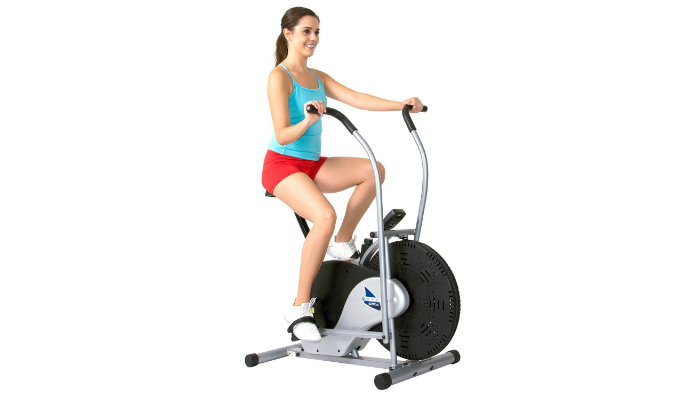 Also called static exercise bikes, upright ones are obviously the most common and affordable. They aim to give you the feel of riding a regular bicycle. They are perfect for beginners who want a little challenge. Upright bikes are also more compact than other types. Despite their simplicity, they can really tone muscles, strengthen legs, and improve endurance. We mentioned earlier that there are different types of exercise bikes. 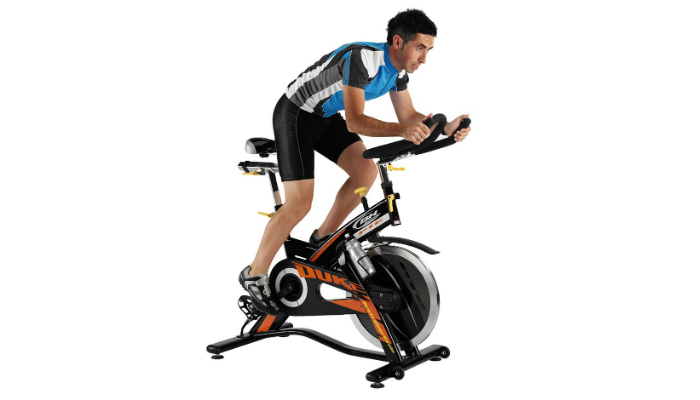 In this section, learn various kinds of exercise bikes other than the upright type. You will also learn how to choose the best upright exercise bike for yourself if you decide to pick one on your own. Before buying an upright exercise bike, make sure that this particular type is what you really want for your fitness goals. 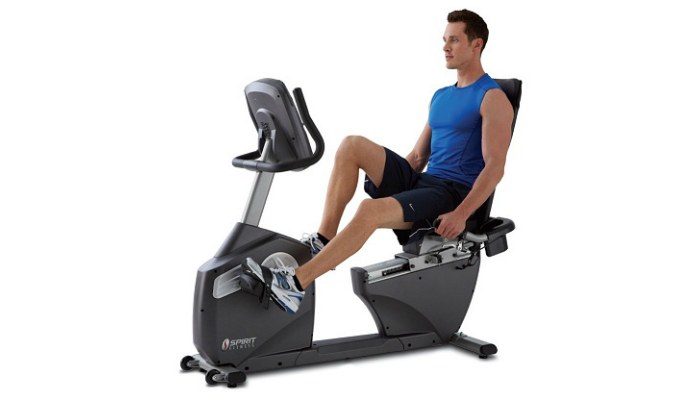 To help you decide easily, we will give common types of exercise bikes and their special features. First, we have the self-powered exercise bike. It does not require any external power source. 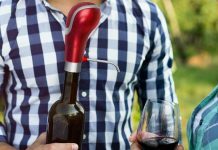 So, it can be placed anywhere inside your home. Other exercise bikes cannot function properly if they are far from sockets. The self-powered type uses an internal power generator. That is why it is more expensive than most variations. Also called an indoor spinning, racing and cycling bike, a training bike is perfect for a more intense workout. It is almost the same as the ones found in spinning classes. It has more resistance levels than other types. Training bikes usually have their saddle and handlebars at the same height. Their flywheel is also open. Meanwhile, recumbent exercise bikes are the most comfortable to use. They ensure that your back is completely supported. On other exercise bikes, you have to straddle. With a recumbent one, however, it is delightfully similar to a chair. People who want more challenge are not fit for this bike. Instead, recumbent bikes help people who are still recovering from back or knee injuries. Still, these exercise bikes have satisfying effects for everyone if used regularly. They target muscles around the bottom and lower stomach. As the final type, we have the combination of recumbent and upright features. Commonly known as hybrid or 2-in-1, these exercise bikes will give you some challenge while ensuring that your back is supported. They can be adjusted to match your posture. They are basically the combination of intense workout and comfort. However, they still cannot push you to the limit, unlike training bikes. In case you get certain about upright ones, we are giving important factors you should consider before purchasing the best upright exercise bike for your weight loss needs. Weight capacity is definitely crucial. For a more versatile type, avoid further problems with upright exercise bikes that have a weight capacity of 300 lbs. or more. Electromagnetic resistance is also useful so you can adjust the bike based on skill level. Meanwhile, to ensure a flawless workout, choose a bike with a big flywheel for smoother pedaling. Of course, you should be comfortable as well; check if the seat is wide and padded. Last but not the least – do not be afraid of innovation. A lot of modern exercise bikes already have a heart rate monitor along their handlebars. Some of them also have several programs to improve your daily exercise goals. These bikes usually have an LCD monitor. We selected Exerpeutic Folding Magnetic Upright Bike as the best upright exercise bike for most people. It has a big weight capacity, a generous seat, and a wide range of adjustments for different skill levels and body types. If you prefer to find the best upright exercise bike on your own, consider the product’s innovative features, resistance, flywheel, seat, and weight capacity. Also, feel free to consider other types of exercise bikes. 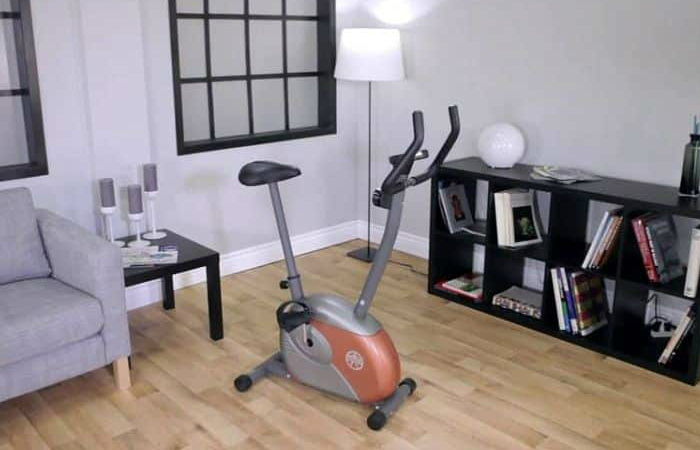 If you are finding the best upright exercise bike so you can start your own workout area inside your house, find out the top five ways on how to create a home gym. Also, if you prefer the real deal, check out our take on the most ideal hybrid bikes and other types of bicycles.